Emma Taylor has returned to Paris, Tennessee to help her Aunt Arabella update her lingerie shop, Sweet Nothings. The big-city fashionista thought she knew want to expect but she never expected to find a dead body smack dab in the middle of the shop. That it was the body of her philandering ex didn’t make the discovery any more “sweet”. She would give anything to have absolutely “nothing” to do with his untimely appearance but she has become the #1 suspect. It will take more than whispering a few sweet nothings in the right person ear to catch the killer and clear her name. A bullet proof bra may come in handy. What a fun start to the new sweet mystery series!! Emma has her hands full juggling the new store decor and merchandise, the grand opening fashion show, and trying to catch a killer. Plus there is that cute handyman around all day. All the characters were engaging and entertaining. I was surprised by the character that quickly became my favorite. Sylvia enters the store pulling her oxygen tank behind her. A “very diminutive woman” with a “paisley scarf wrapped around her head, large hoops dangling for her drooping earlobes”, leaving a recently extinguished cigarette out on the walk. She turned out to be a spitfire with a few hidden talents. She was quite inspirational too. We all need a Sylvia in our lives. I solved the mystery early on but the author has brought us a to place we will want to visit again and again. This is a nice, light mystery to read on a relaxing afternoon. Cozy lovers will really enjoy this series debut and will be anxiously awaiting the next installment. 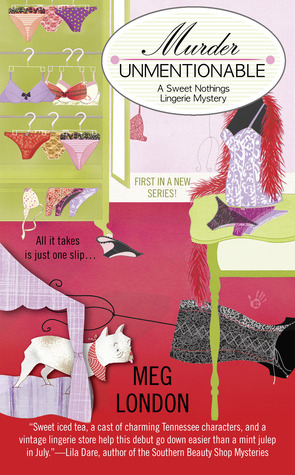 Meg London is the alter ego of author Peg Cochran. Check out her webpage here. Like here Author Fan Page on FaceBook here.